As a follow-up to the articles on the Brewers' mascot goat, Fatima, I would like to supply some information on her last(?) season with the Brewers. And some details on a competitor. After the 1914 season Brewer pitcher Ralph Cutting decided to retire. The little lefty spitballer, who had been with the Brewers since 1910, winning 64 games in that span, including 21 in 1913, said he would go into the diary business with a brother at his home in Concord, New Hampshire. Cutting had been sick during the 1914 season, and did not feel up to playing baseball any more. He was quoted in the Milwaukee Sentinel: "My salary whip can work twelve months out of twelve milking cows and it has baseball beaten by a mile. There is nothing to worry about except the milk inspector, and the water supply is plentiful." One early question after Cutting's retirement was what would become of Fatima, Cutting's pet goat and Brewer mascot. Fatima had been purchased in 1913 by Larry Chappell and Ralph Cutting and immediately became the Brewer mascot. After Chappell left the Brewers in July 1913 she became sole property of Cutting. It was now decided the goat would be allowed to roam Athletic Park under the supervision of the groundskeeper. 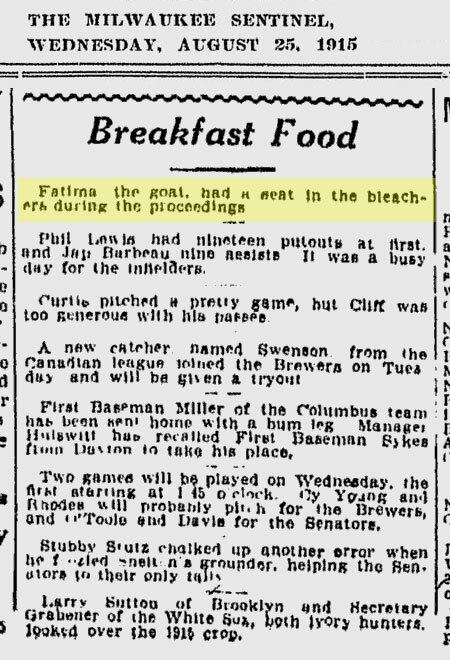 When the 1915 season opened it was reported Fatima, "fatter and sleeker than ever, was on the job, eating beer labels and peanuts with as much gusto as ever". Eight thousand Milwaukeeans attended a game at Athletic Park against the Cleveland Spiders on May 23, 1915, not so much to see Brewer pitcher Cy Slapnicka on the mound, but to see Mlle. Bridget Pumpernickel, auditioning for the job of the Brewers new mascot. The bear cub had been captured in the wilds near Rhinelander and Brewer president A. F. Timme purchased the animal from Dave Bell "Toodles" Perk, the "Farwell avenue Hagenbeck". Pitcher Tom Dougherty assumed the right to act as nurse to the newcomer and the big right hander showed his bear training ability by teaching the cub how to execute an artistic somersault. It was reported Mlle. Pumpernickel's debut was a huge success. However, manager Harry Clark, a superstitious man, believed that Fatima was the cause of the team's success. So for the time being, at least, Pumpernickel would have to warm the bench. It was not exactly clear who (what) was the Brewer mascot at this point in the season. But on occasion the bear was still referred to, so she was at least at the park, as was Fatima. 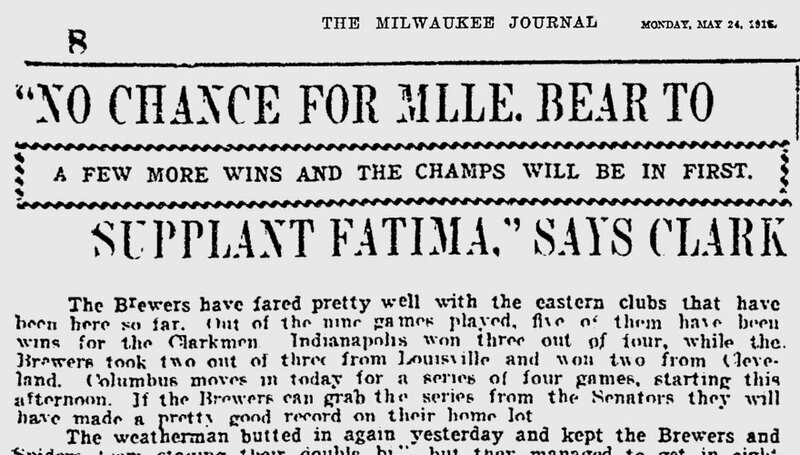 During the first game of the Brewers/Saints double header on June 20, 1915, Fatima made her presence known. The Sentinel reported the game had to be halted for a minute or two as Brewer pitcher Red Shackelford chased the "browser" off the base lines. However, only the day before the Sentinel referred to the bear cub as the mascot. The city had undergone another rainstorm that day and Athletic Park was very soggy. The morning newspaper wrote: "At the suggestion of Tom Dougherty, Mme. Pumpernickel the latest Brewer mascot, is to be canned and a finnan haddie installed in her place. There will be plenty of room in Athletic Park for the fish to enjoy himself." We also find that Mille. Pumpernickel was still with the team on the Fourth of July. The Sentinel told it readers she was out in the center garden, and "grows bigger each week." Pumpernickel was officially released as the Brewer co-mascot on July 30. Brewer President Timme said he had turned the bear cub to Milwaukee's Washington Park Zoo (the current Zoo wouldn't open until 1958). The Sentinel later reported the bear cub—now called Tim by the newspaper—had started to show evidences of an artistic temperament, and President Timme believed there was enough temperament among his regular baseball players. There was no record of how Fatima felt about this. We only know that Fatima was still living at the ballpark. Earlier in the month it had been reported she was in the stands with one of the ballplayers' wives while the bear cub paraded in front of the stands for the fans between games of a doubleheader. The last we hear of Fatima this season was on August 24, when it was said she had a seat in the bleachers during the game with Columbus, a win by the way. 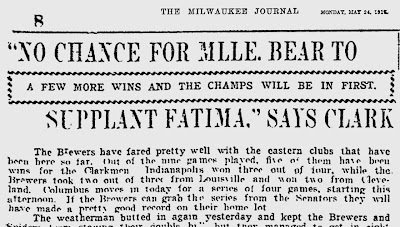 In my research of the 1916 season I do not come across Fatima at all, so I assume she was gone from Athletic Park.